America is God’s Crucible, the great Melting-Pot where all the races of Europe are melting and re-forming! Here you stand, good folk, think I, when I see them at Ellis Island, here you stand in your fifty groups, with your fifty languages and histories, and your fifty blood hatreds and rivalries. But you won’t be long like that, brothers, for these are the fires of God you’ve come to—these are the fires of God. A fig for your feuds and vendettas! Germans and Frenchmen, Irishmen and Englishmen, Jews and Russians—into the Crucible with you all! God is making the American. That was then. Americans don’t melt anymore. Instead, we have chosen to hang onto our “blood hatreds and rivalries.” Now, we are polarized and offended. I shared this idea with someone and they seemed surprised. “You want that?” she asked. She had confused the idea of people entering the nation illegally through porous borders with the concept of legal immigrants coming to America and becoming American. There would be no America without immigration. Illegal immigration has tarnished the vision of immigration as it ought to be. It is understandable that the vision of America as a melting pot would be lost in the midst of daily examples of “Americans” who are offended. This present politically/socially correct disease, with its angst over things as foolish as cultural appropriation is really just the flowering of the failed philosophies of the Enlightenment. There was a time when it was common to assume that, with all of the cultural diversity in the world, there were certain universal principles to which all humanity could be held to account. But the Enlightenment era did away with such belief and replaced it with a deep selfishness that was delayed in America by our fight for independence and, frankly, by the grace of God. But now, the seeds of selfishness have flowered. Much of this is taken up in the discussion of Cultural Coherence. Anthony Pagden, in his book The Enlightenment, explains that, with the onset of the Reformation and a new era in which modern thinkers “had made the ‘I’ the center of all inquiries into the human condition,” the fading of Scholasticism in favor of a “mechanistic” view of the universe, religious wars which left millions dead, and even the discovery of diverse peoples in Africa, Asia, and particularly the American Indian, the idea that all humanity in some way cohered together, enjoying some universal set of values, beliefs, and a common human nature, collapsed. Faced with such uncertainty, the only possible conclusion to which any reflective person could come was that there could be no certainty, no undisputed source of authority, in the world . . . Now everything that was known about the world, the rightness or wrongness of every act, had to be decided by the individual acting on his or her own. The philosophical, theological coherence provided by the accepted authorities (the Church, the Bible) in the areas of life that mattered most (heaven, hell, the existence of God, the Cosmos, etc.) was gone. The so-called “turn to the subject” which began in the pre-Reformation, was evidenced in the Reformation, observed by Galileo’s telescope, and codified and canonized by Descartes cogito ergo sum and Kant’s call for humanity’s release from its “self-incurred tutelage,” all came together to midwife the birth of the modern self. But the American experiment was to be different. America was different for a long stretch. She believed in God and decency. But Enlightenment era philosophy was always part of her DNA ,and when she decided that she no longer needed God, the seeds of that philosophy began to grow. In the past sixty years, America has invited God to leave her schools, supported abortion, crowned Evolution in place of a belief in a Creator, and embraced the abomination of homosexuality. No, America doesn’t melt anymore. Her heart does not melt for God, it does not melt over her sins, and her people do not allow their petty differences to melt into unity. Anthony Pagden, The Enlightenment, (New York: Random House, 2013), 24-64. Immanuael Kant, Foundations of the Metaphysics of Morals and What is Enlightenment?, (New York: The Bobbs-Merrill Company, 1959), 85. 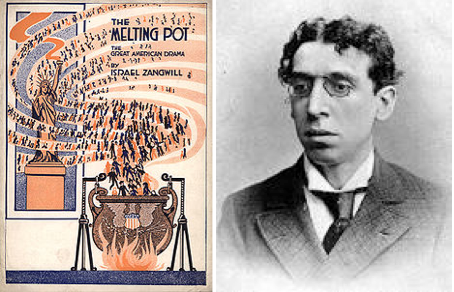 Israel Zangwill, “The Melting Pot,” Act I.